The stock market has certainly been less popular than back in the late 1990s. I remember the Dow Jones was making new highs almost every day and everyone was making double digit yearly gains. People were quitting their jobs and day trading. Teenage kids were writing books about how they made a million dollars trading stocks. Semiconductor stocks and internet stocks were getting valuations in the hundreds or thousands of multiples on earnings. And that was in the rare cases when they had earnings at all! The stock market has been performing much more in line with historic trends since that times which hasn’t been quite as fun. 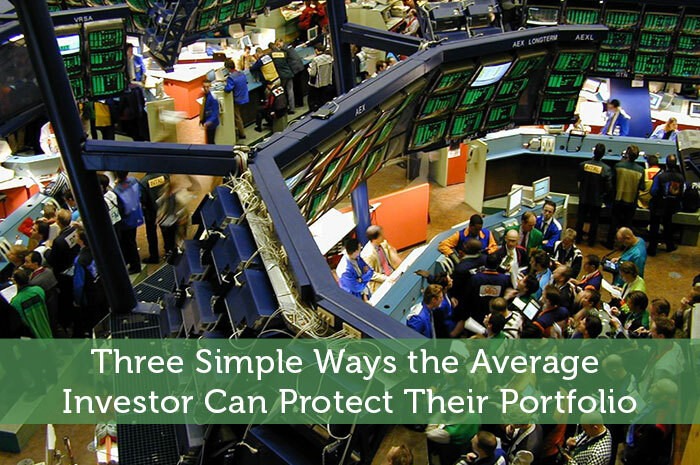 But there are three simple ways (you don’t have to trade futures or options) that the average investor can protect themselves from risk while investing in stocks. One of the easiest ways to build wealth defensively is to use dollar cost averaging. This is a disciplined approach to investing which can reduce the volatility of your returns. Every situation is different but I have found this to be a great way to buy stocks without worrying about timing the market. This approach can save you thousands if not millions of dollars over the long-term by reducing the risk of poor market timing and giving you an average cost of an investment instead of an extreme high or an extreme low. If you’ve done any reading about diversification you’ve probably heard of index funds or the value of having a well balanced portfolio of stocks. You’ve also probably heard about the concept of asset allocation. And these are important concepts to implement in your portfolio. But dollar cost averaging is a different strategy which can also protect you from putting all your eggs in one basket from a timing perspective. Think about it, if you were to invest $120,000 on a single day, even if you are purchasing a balanced portfolio of investments, you are exposing yourself to massive timing risk. This is the risk that you are purchasing at a peak in the market. There have been periods of history where the stock market or a given stock will drop and not go up again for years. If you had happened to buy into the market at the peak you would experience the worst of the declines and be faced with a very difficult choice: either sell your holdings and take a massive loss or wait it out for 10, 15, or 20 years with no guarantee of a good result. Dollar cost averaging helps you avoid this risk by making steady investments at a pre-defined time interval (weekly, monthly, quarterly, or annually) so that you don’t have to worry about timing the market. It also happens to be a perfect way to build the discipline to invest with every paycheck. When you invest through a 401(k) or by monthly withdrawals from your bank account you are automatically doing this. And that’s a smart thing to do. Another way to invest defensively is to look for stocks paying a good dividend. The dividend paid to you will be a way to make an even greater return or offset your losses. Dividends give you an opportunity to buy more shares at a lower price which will further reduce your total cost of ownership. This strategy goes hand-in-hand with dollar cost averaging as it pushes your average cost per share even lower. It is often the case that a company will increase dividends over time so not only are you getting a dividend yield on top of your capital gains, you’re also going to get an increasingly larger dividend over time. Dollar cost averaging, dividend payments, and increases to the dividend really begin compounding over time. Obviously you need to have a disciplined approach for this to work because the strategy is designed to continue buying shares as the market declines in order to get a lower average cost. You end up reaping this reward later when the market goes back up again. So you can’t lose your stomach for the strategy part way through or you’ll lock in significant losses. Look for sustainable dividends that are backed by a business strategy which is very steady. This leads to the third way to protect your portfolio. Invest in a steady business in a steady industry. Think about graveyards, trash companies, utility companies of all stripes including water, natural gas, electric, and others. Many of these business are downright boring. You’re not going to see the next big technological advance or breakthrough product come from these industries. But you will see solid consistent returns and often a very healthy dividend that is increasing. You can find these types of businesses in some industries that are relatively new. I would argue that for some portfolios a stock like Microsoft could fit in this category. With a dividend at the time of writing of 2.6% and a steady business it could be an opportunity. Overall I would suggest using an ETF or Mutual Fund as the best vehicle to capture dividends and capital gains appreciation while still diversifying away from the single-stock risk that investing solely in Microsoft would still expose you to. One way to help illustrate the power of this strategy is to look at a real life example. 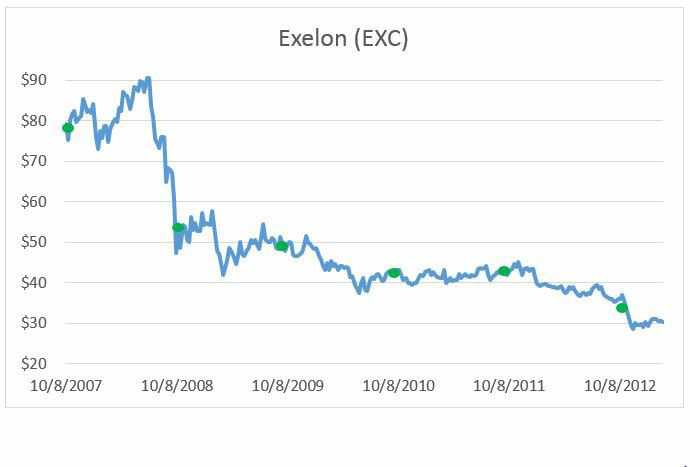 Let’s take a look at the Exelon between 2007 and 2012. This was a bad time for the stock market and a bad time for Exelon. I want to pick a realistic scenario to show for one how poorly even a defensive stock can perform but also to illustrate the defensive power of these strategies. This is a really negative scenario to illustrate how dollar cost averaging would help you save thousands of dollars compared to if you had invested all of your money in 2007. First let’s look at what would have happened if you had simply invested $120,000 all in October 2007. You would have purchased 1,515 shares of EXC at about $78.18 per share. The stock subsequently dropped into the $50’s the next year and kept going down. By the end of 2012 the stock was at $30.35 per share and your stock would only be worth $46,000 which is less than half your original investment! You would have received dividends of about $17,000 during that time so you can see that part of the strategy helped. This means your original $120,000 investment would now only be worth about $63,000. That’s a 48% loss and is pretty dismal. I wanted to note that the above illustration shows how even buying a steady company in a steady industry can be risky. You can also see that the dividend turned a 62% loss into only a 48% loss. That’s good defense. But now let’s look at how dollar cost averaging could help. The above chart shows how six annual purchases of Exelon of $20,000 would have occurred. This would result in a massive difference in your average cost per share: instead of $78.18 per share you end up averaging $42.69 per share. There are two things happening here. First, as is made clear by the chart, 5 of the 6 purchases are below $60 per share. Think about how much better that is than making the entire purchase at almost $80 per share. This creates a dramatic difference. Second, I also introduced into this scenario the use of dividends to purchase even more shares at a lower price. As I said, these strategies go hand-in-hand. Although you are getting less dividend income because you owned fewer shares during the entire period of 2007 to 2012 (only $13,750 compared to about $17,000) the purchase of shares at a lower cost more than makes up for it. The $13,750 was reinvested at an average cost of $44.07. So with dollar cost averaging and dividend reinvesting your $120,000 investment results in a portfolio value of about $85,000. I told you this was a rough scenario. But look at the difference. You have $85,000 instead of only $63,000 and you invested with the confidence that by implementing a disciplined strategy you will succeed over the long term. This $22K difference is massive in the long-run. And if you are working with a portfolio value of $1.2M instead of $120K you see that the difference would be $220,000. That is huge. These three strategies are easy to implement. Find a mutual fund focused on value stocks with hefty dividends and simply choose the dollar amount and time period in which you will invest. Then every month or quarter make your purchase. That’s all you have to do! Keep in mind that in a rising market dollar cost averaging will result in a higher average cost. Yes this won’t give you as high of a return but it will reduce your timing risk. The point of dollar cost averaging is to reduce your risk and capture steady long-term returns – not to time the market. JH lives in the Mid-Atlantic region with his wife and children. He is a finance manager for a Fortune 500 Company with over 10 years’ experience and has an MBA and CPA. He writes for the blog Patient wealth.